On June 2, 2003, the European Space Agency’s (ESA) Mars Express orbiter was launched toward the red planet, entering into orbit just six months later. Though the accompanying Beagle 2 lander failed to establish radio contact from Mars’s surface, the orbiter is still swinging around Mars ten years on. 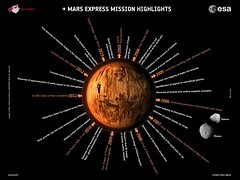 Mars Express orbits roughly every 8 hours to collect data on Mars, its moons, and even the Sun.